There are currently[when?] thirty-five chapters and eight colonies of Triangle Fraternity active in the U.S. The headquarters is located in Plainfield, Indiana in a historic building built as a Carnegie library in 1912. ^ "Graphics Library". Triangle Fraternity. Retrieved 2015-05-10. ^ "Triangle Fraternity Mourns the Loss of Br. Richard H. Sudheimer minn52". Triangle Fraternity. Archived from the original on 2015-01-14. Retrieved 2015-05-10. ^ "Triangle Headquarters". Triangle Fraternity. Archived from the original on 2014-12-19. Retrieved 2015-05-10. 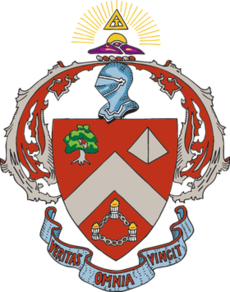 This page is based on the Wikipedia article Triangle Fraternity; it is used under the Creative Commons Attribution-ShareAlike 3.0 Unported License (CC-BY-SA). You may redistribute it, verbatim or modified, providing that you comply with the terms of the CC-BY-SA.